Buffer is an online social media management tool that will enable you to schedule social media posts for Facebook, Twitter, LinkedIn, Google+, Pinterest and Instagram. Buffer will help you increase your following, engage your audience and build your brand, saving you a lot of time. The best thing about this tool is that it allows you to connect multiple accounts to one dashboard. You can schedule posts, create campaigns and analyse the outcome of your posts. Buffer’s free plan is great for new businesses who want to grow their social media presence. Blogging is a great way of driving traffic to your website and boosting your credentials. WordPress is a straightforward tool used by millions, with plenty of themes and plugins to choose from to make your Blog unique. Having visual content on social media is becoming an increasingly popular form of marketing. From infographics to custom illustrations, visual content is a brilliant way for entrepreneurs to build a professional appearance and gain credibility. Luckily for most business owners, you don’t need to be a graphic designer to use this simple tool. You can create almost anything visual on Canva, from social media images and infographics to flyers and brochures. Its free library of illustrations, templates, fonts and images give you plenty of graphics that you can easily play about with. While building your brand on social media platforms is effective, email marketing is vital to the success of most businesses. It allows for a more intimate interaction between you and the consumer by offering you the tools you need to nurture leads. MailChimp is a fantastic free email marketing tool and one of the easiest for new businesses owners to learn. Surveys are a great way to collect consumer information, uncover trends, engage customers and gain tangible insights on your business. SurveyMonkey is one of the most popular free online survey tools, and is incredibly simple. Within just a few minutes, you can create, design and publish your own business survey. Plus you’ll be able to analyse the results. Organisation is crucial when it comes to marketing your business; if you’re able to prioritise and organise your notes, you might not be able to act on opportunities. Evernote is a tool where you can capture inspiration, ideas and trends, and store them all in one easily accessible place. It can be accessed on your laptop, mobile or tablet, making it the ideal tool for finding and storing content ideas, brainstorming, market research and competitor analyses. As we previously said, having visual content on social media is becoming an increasingly popular form of marketing. New business owners often get into trouble by using online images that aren’t royalty-free; the use of these can result in a fine. So in a previous article, we created a list of brilliantly free stock photo websites. 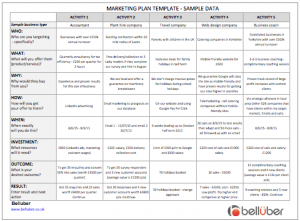 Download this Free Marketing Plan Template to easily keep track of your marketing activities.